Bradley Wilson-Dean has made a stunning start to the season. Team boss Carl Johnson reckons a ‘massive’ May lies ahead for Panthers. The city team are currently in the middle of a break of just over a fortnight without a SGB Championship fixture - but that calm will be followed by a storm of eight meetings in just 22 days next month. Panthers have four home outings at the East of England Showground and will also embark on two mini Northern tours during a hectic schedule in which Johnson wants them to emerge as play-off contenders. They face early leaders Edinburgh, a highly-rated Newcastle and rock-bottom Berwick (who have already ripped up their struggling side with a stack of changes) twice in May. They also go to mega-bucks Glasgow before ending the month with a tasty home tussle on Bank Holiday Monday (May 29) against a Workington side led by Craig Cook, who spearheaded the city team for much of last season. “It might still be relatively early in the season, but May is going to be a massive month,” insisted Johnson. “We’ve got a lot of meetings in a short space of time and the league will start to take shape very quickly. “We’ve enjoyed a good start to the season by winning five of seven meetings in the SGB Championship and the KO Cup. “Our home form was something we needed to address and that has been very pleasing so far, while we’ve also showed we are still capable of picking up results on the road. “Now we’re looking to kick on and a good run of form during May could really push us up the table. Panthers currently sit fifth in the SGB Championship standings with only an inferior points difference keeping them out of a play-off spot. Johnson was yesterday still awaiting confirmation of the new greensheet averages for May. New Zealand champion Bradley Wilson-Dean’s stunning start to the season is almost certain to lead to him climbing into the main body of the team. That would mean a drop to reserve for Simon Lambert, who has endured a tough opening few weeks of the campaign. Johnson also expects to have Kenneth Hansen available again for the hectic May spell. He has missed the last four meetings through illness. Lambert and winter signing Paul Starke both compete in British Championship semi-finals in the coming days. 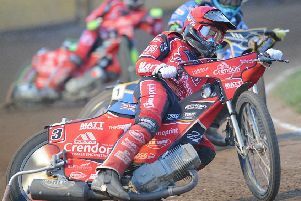 Starke, who racked up 10 points in the final itself last year, goes to the first semi at Newcastle on Sunday while Lambert races in the second semi at Sheffield next Thursday.